His­tor­i­cally, small com­mu­ni­ties in our steep, moun­tain­ous region have been sit­u­ated on or near large flood­plains, some­times at stream con­flu­ences. Our chal­lenge now is to man­age and reduce the risk of flood­ing and ero­sion to com­mu­ni­ties. 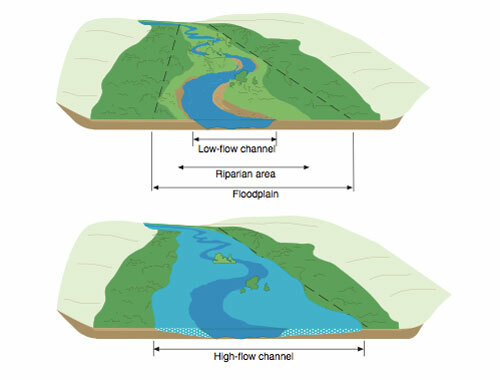 One way to approach this is to main­tain the abil­ity of streams to move water, sed­i­ment, and debris through pop­u­lated areas while using the nat­ural capac­ity of flood­plains to store water and reduce haz­ards else­where in the stream system. Com­mu­ni­ties and prop­erty own­ers can take action to reduce flood risks, includ­ing: 1) avoid­ing future devel­op­ment in areas sub­ject to repet­i­tive flood dam­ages; 2) flood proof­ing and ele­vat­ing struc­tures to reduce dam­ages where exist­ing infra­struc­ture is at risk; and 3) devel­op­ing early warn­ing sys­tems, flood response plans, and com­mu­nity flood mit­i­ga­tion plans. Recently, AWSMP pro­vided fund­ing to the Town of Shan­daken to cre­ate a Flood Mit­i­ga­tion Plan for the greater Shan­daken com­mu­nity. Over the next few years, AWSMP will expand assis­tance to water­shed munic­i­pal­i­ties for local flood haz­ard mitigation. AWSMP also pro­vides assis­tance with flood recov­ery and response fol­low­ing major flood events. Fol­low­ing Trop­i­cal Storms Irene and Lee, Ulster County Soil & Water Con­ser­va­tion Dis­trict tech­ni­cians assisted high­way depart­ments and the National Guard with restor­ing streams back into their orig­i­nal chan­nels and cre­at­ing designs to help alle­vi­ate future flood­ing. Cor­nell Coop­er­a­tive Exten­sion of Ulster County employ­ees pro­vided guid­ance to area landown­ers and worked with local code enforce­ment offi­cers and build­ing depart­ments to deter­mine the appro­pri­ate scale of dam­ages for sub­mit­tal of claims to FEMA. Water flows onto the flood­plain dur­ing a high water event. The National Flood Insur­ance Pro­gram (NFIP) offers flood insur­ance to home­own­ers, renters, and busi­ness own­ers. Par­tic­i­pa­tion in the NFIP is based on an agree­ment between com­mu­ni­ties and the Fed­eral gov­ern­ment. Through the NFIP, the Fed­eral Emer­gency Man­age­ment Agency (FEMA) pro­vides maps of haz­ardous areas and pro­vides fed­er­ally backed flood insur­ance. In return, com­mu­ni­ties agree to enact and enforce flood­plain reg­u­la­tions intended to min­i­mize the threats to life and prop­erty. All com­mu­ni­ties in the Ashokan Water­shed par­tic­i­pate in the NFIP. In July 2012, the U.S. Con­gress passed the Biggert-Waters Flood Insur­ance Reform Act of 2012 (BW-12) which calls on the Fed­eral Emer­gency Man­age­ment Agency (FEMA), and other agen­cies, to make a num­ber of changes to the way NFIP is run. Some of these changes already have occurred, and oth­ers will be imple­mented in the com­ing months. Key pro­vi­sions of the leg­is­la­tion will require the NFIP to raise rates to reflect true flood risk, make the pro­gram more finan­cially sta­ble, and change how Flood Insur­ance Rate Map (FIRM) updates impact pol­i­cy­hold­ers. The changes will mean pre­mium rate increases for some—but not all—policyholders over time. Home­own­ers and busi­ness own­ers are encour­aged to learn their flood risk and talk to their insur­ance agent to deter­mine if their pol­icy will be affected by BW-12. For more infor­ma­tion visit FEMA’s web­site on NFIP changes. 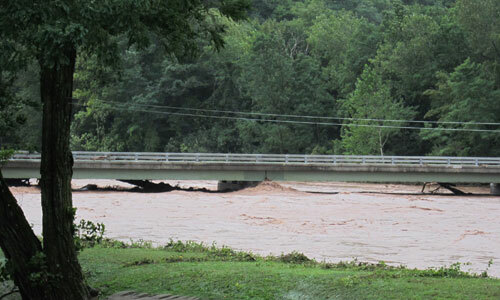 Trop­i­cal Storms Irene and Lee as well as Super­storm Sandy struck our region hard over the past few years. In response to the destruc­tion they caused, var­i­ous lev­els of gov­ern­ment (fed­eral, state and local) have allo­cated money to grant pro­grams to help with recov­ery and revitalization. Fund­ing Avail­able: $663 mil­lion on a first come, first-served basis. Eli­gi­bil­ity: Home­own­ers and busi­ness own­ers in Ulster and Sul­li­van counties. The Haz­ard Mit­i­ga­tion Grant Pro­gram (HMGP) pro­vides grants to states and local gov­ern­ments to imple­ment long-term haz­ard mit­i­ga­tion mea­sures after a major dis­as­ter dec­la­ra­tion. The pur­pose of the HMGP is to reduce the loss of life and prop­erty due to nat­ural dis­as­ters and to enable mit­i­ga­tion mea­sures to be imple­mented dur­ing the imme­di­ate recov­ery from a dis­as­ter. The HMGP is autho­rized under Sec­tion 404 of the Robert T. Stafford Dis­as­ter Relief and Emer­gency Assis­tance Act. Fund­ing Avail­able: Varies by dis­as­ter declaration. Eli­gi­bil­ity: State and local governments. Local Flood Haz­ard Mit­i­ga­tion Analy­sis is a New York City funded pro­gram devel­oped at the request of West of Hud­son NYC Water­shed com­mu­ni­ties. The pro­gram funds a two-step process to con­duct engi­neer­ing analy­sis to deter­mine the causes of flood­ing and eval­u­ate mit­i­ga­tion options artic­u­lated in a flood haz­ard mit­i­ga­tion plan, fol­lowed by project design and implementation. Fund­ing Avail­able: $2,000,000 in the Ashokan Water­shed for eli­gi­ble pop­u­la­tion centers. Eli­gi­bil­ity: Open only to eli­gi­ble West-of-Hudson NYC Water­shed communities. Admin­is­tered by: Cor­nell Coop­er­a­tive Exten­sion of Ulster County and Ulster County Soil and Water Con­ser­va­tion District. Web­site: Con­tact local Stream Man­age­ment Pro­gram offices for addi­tional details. This is a New York State pro­gram whose pur­pose is to develop com­pre­hen­sive local rebuild­ing plans for spec­i­fied com­mu­ni­ties affected by Irene, Lee and Sandy. Funds will also be used to imple­ment mea­sures iden­ti­fied in approved plans. Fund­ing Avail­able: $3 mil­lion for Town of Shan­daken; up to $3 mil­lion for other Ulster County Communities. Eli­gi­bil­ity: Town must develop a CRZ plan to access imple­men­ta­tion funds. The National Flood Insur­ance Act of 1968 directed the fed­eral gov­ern­ment to iden­tify all flood prone areas within the United States and estab­lish risk zones within those areas. In response, FEMA cre­ated maps depict­ing areas mod­eled to have a higher risk of flood­ing. (Areas not in mapped zones can still flood!) The maps are called Flood Insur­ance Rate Maps, although most peo­ple sim­ply know them as FIRMs. The FIRMs depict areas sub­ject to addi­tional reg­u­la­tions because of the flood haz­ards, or the “reg­u­lated flood­plain.” As part of the National Flood Insur­ance Pro­gram (NFIP), the fed­eral gov­ern­ment pro­vides FIRMs and flood insur­ance to com­mu­ni­ties that agree to reg­u­late devel­op­ment in high-risk flood areas. FIRMs form the basis for fed­er­ally back flood insur­ance rates. FEMA recently updated FIRMs for parts of Ulster County. Pre­lim­i­nary FIRMs, Flood Insur­ance Study (FIS) reports, and FIRM data­bases are avail­able to towns in the Ashokan Water­shed. In the com­ing months, munic­i­pal­i­ties will be review­ing the maps and con­sid­er­ing them for adop­tion. Ulster County has pro­vided a fact sheet explain­ing NFIP and FIRM revi­sions for residents. Pre­lim­i­nary FIRMs can be viewed with par­cel bound­aries on the Ulster County Par­cel Viewer. The Pre­lim­i­nary FIRMs and Flood Insur­ance Study for the Ashokan Water­shed are avail­able as pdfs for down­load. (These are large files and may take some time to down­load.) Printed maps are avail­able at your Town Hall.